What is happening to U.S. retail stores? Have you tuned in? The hot topic on Wall Street these days seems to be revolving around retail stores downsizing, filing bankruptcies, or even closing down. You could be asking yourself, “How could this be when the economy seems to be going vertical and the Dow, Nasdaq, and S&P are all indicating positive numbers?” Are we seeing the death of retail in 2017? Big retailers such as Kohl’s and Macy’s didn’t end 2016 celebrating a successful holiday season. Kohl’s shares, for example, dropped as much as 20.5% on January 5 after reporting November and December holiday same-store sales were down 2.1% from 2015. This was the biggest drop in over 14 years. Macy’s stock fell as much as 14%, the biggest percentage drop in seven months. Same-store sales for November and December were down 2.1% compared to the same period in 2015. Other retailers such as Sports Authority (once the largest sports store) filed bankruptcy and eventually closed down. So Where are Customers Shopping Now? Data shows internet sales rose about 23% in 2015, and during Black Friday 2016 about 10 million more Americans shopped online than in stores. A new report from Forrester titled “U.S. Cross-Channel Retail Forecast, 2015 To 2020” predicts online sales will grow by an average annual rate of 9.32% over the next five years, clearly shifting the focus from traditional store shopping to online shopping and spending. Research indicates more and more people are turning to online purchasing, with mobile sales being the platform of preference within millennials. Macy’s – With a new CEO, Jeff Gennette, in 2017, Macy’s expects to close more than 36 stores and eliminate 4,500 jobs in efforts to boost profitability. JCPenney – The Texas based retailer has been closing stores since 2014. It currently has over 1,000 stores and had announced cost-cutting measures like cutting payroll and eliminating overtime hours for employees for 2016 and 2017. Kmart & Sears – Owned by Sears Holdings Corp, 108 Kmart stores and 42 Sears stores will be closing. In the most recent quarter, Sears’ revenue fell 13% to $5 billion, and its losses widened to $748 million from $454 million in the same period last year. So Who Are the Two Giants Taking Over in E-commerce? The titans taking over in e-commerce are Amazon and Walmart. More customers are making purchases through these online portals than ever before. Amazon just superseded Walmart in online sales. The Wall Street Journal reported Walmart’s e-commerce sales in 2015 totaled about $14 billion, which was just 3% of its $482 billion in total yearly revenue. As a comparison, Amazon’s sales hit $107 billion last year, which clearly shows Amazon is now the leader in this clash of the titans saga. As we can tell through the numbers, there’s a huge migration of customers going from retail to online shopping. With Amazon providing one click buys and 1-2 day shipping, society is creating a new retail culture: a demand for instant results, buying from the comfort of your home, competitive deal-shopping with a click of a button, and having your goods hand delivered to you. Thank-you FedEx and UPS! The reality is, most often that not, it’s really hard to compete with irresistible online deals which flash in your face every page you open! In essence, I believe retail isn’t going to die. In fact, I think retail stores will downsize significantly in order to keep their better producing stores open, but I don’t think, for example, a store like Macy’s would close down all their stores nationwide. Remember, there is still a significant percentage of customers still buying in person, yet simply not as much as before. 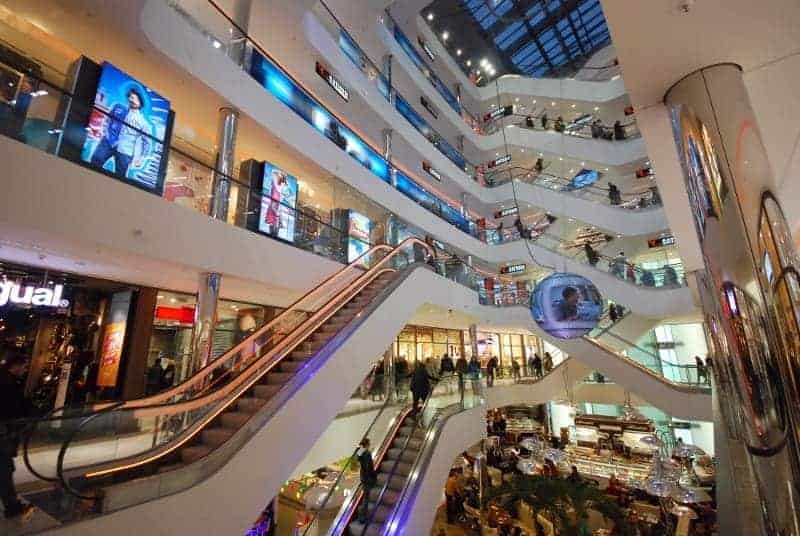 Retail stores such as Target, Costco, Walmart, Nordstrom, and Nieman Marcus must keep some stores open, because there are sectors in retail where customers prefer to be in person in order to purchase. B: Go in person to smell the perfume and in person to sit/lay on the mattress, then buy it. Most people would say B: Go in person to smell the perfume and in to person sit/lay on the mattress, then buy it. There are some things that can’t be explained online through an image, testimonials/reviews, or even through a video. There are things you have to go test for yourself, period, right? What if you’re a gentleman who is ready to propose to the lady of your dreams. You shop online to see what rings look like and cost. But would you really buy a $20,000 ring from an online source, or would you want to see the $20k ring for yourself, see the cut and clarity of the stone, and perhaps see the certificate of authenticity IN PERSON before swiping your card? I think most men would agree they’d want to go in person and check out the ring themselves before taking a risk online and potentially going in the hole $20k. For this reason, retailers can’t all shut down. There is merchandise the consumer has to smell, taste, touch, or feel or even see in person before taking the next step and purchasing it. And these types of items will have us going back to the mall every time… So no, retail isn’t dying, it’s simply adjusting to the new wave of online buying. Retail store fronts must think differently in order to attract and retain their customers, moving forward. Aside from creating an enjoyable shopping experience, retail stores must think about offering competitive pricing across the board. Think about it. The reason why Amazon and Walmart have risen to the forefront of online sales is because they offer an easy and clickable experience for the consumer to search and compare product and pricing for tens of thousands of products all in one site. Who can beat that?! Today, 81% of online shoppers conduct online research before purchasing. Let’s be honest, customers are more savvy these days, and they don’t want to pay more than they have to. Customers spend hours in the comfort of their sofas finding the best deals. In order for retail stores to either stay afloat or stay ahead of the game, they must think outside of the customer experience thinking-model and restructure their pricing offering to be more appealing in stores, as their online counterparts are in the world wide web. WHAT DO YOU THINK, Stiletto Doll? Chime in and tell us your favorite online stores you’ve bought from in the last 2 months? Is one of them Amazon, by any chance?